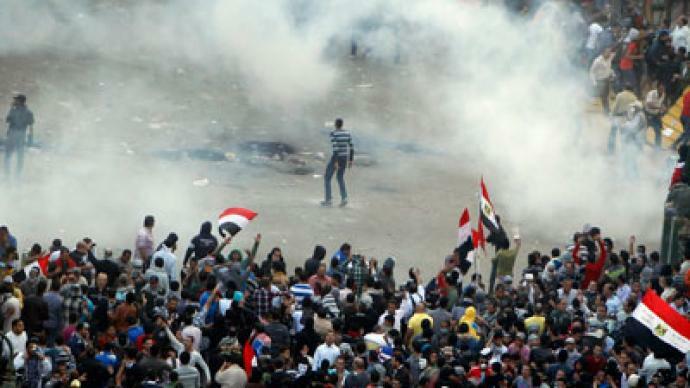 Police fired tear gas at protesters as supporters and opponents of President Mohamed Morsi clashed in Cairo. Over 100 people were reportedly injured as sporadic clashes continued into the night, while protesters organized a sit-in on Tahrir Square. ­“I’ve witnessed very heavy police tactics. Officers used a lot of tear gas and threw rocks down on protesters from buildings. 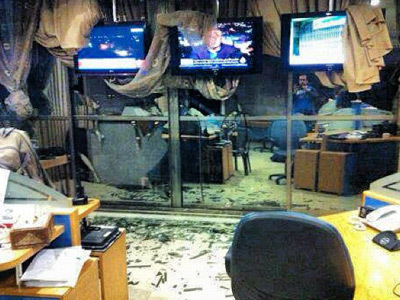 I’ve also seen Molotov cocktails being thrown back and forth,” Cairo-based journalist Bel Trew told RT. According to the Ministry of Health, at least 140 people have been injured in clashes between Morsi's supporters and opponents on Friday, Al Arabiya reports. A coalition of 26 political movements opposing the Egyptian president has started a week-long sit-in protest on Cairo’s Tahrir Square. There were reports of police and security forces trying to break up the protest with tear gas on several occasions during the night. Demonstrations took place in several cities throughout the country after the leader signed a controversial decree expanding his powers. Earlier Friday, demonstrators clashed with police in Alexandria, Egypt, as they protested against President Morsi. 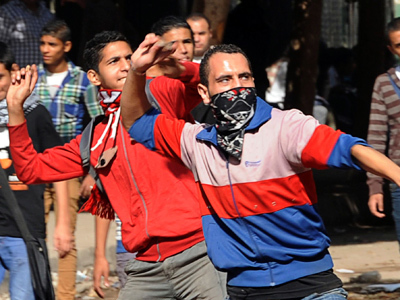 Casualties were reported at the protests, and Morsi opponents set fire to Muslim Brotherhood offices in the Suez Canal cities of Suez, Port Said and Ismailia, state TV said. Thousands of demonstrators threw stones and chunks of marble at each other outside an Alexandria mosque after Friday prayers. Anti-Morsi protesters threw firecrackers at supporters of the Brotherhood, who used prayer rugs to shield themselves. Protesters both for and against President Morsi also rallied in the streets of Cairo, Egypt. 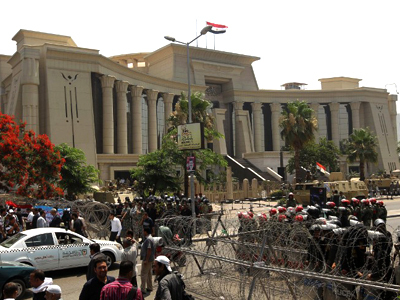 Supporters of Morsi chanted, "The people support the president's decree" in front of the presidential palace, AP reported. The demonstrations follow a call by the Egyptian opposition to protest what they called a ‘coup’ by Morsi. "The opposition is very strong right now. This has actually, in a strange way, united the opposition forces who have been quite divided recently," Trew said. Morsi recently issued a declaration granting his office wide-ranging powers, effectively neutralizing Egypt’s judicial system and preventing it from challenging his authority. The declaration prompted Morsi's Coptic Christian assistant, Samir Morcos, to resign. 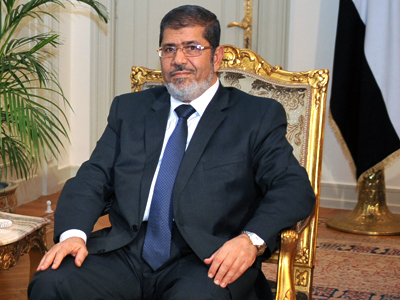 Al-Arabiya has reported that Morsi's Aid, Sakina Fouad, has also resigned in protest. "What we’re seeing here is massive criticism of the president and quite a lot of fear that he’s becoming a new dictator. Because right now, he actually has more powers than Mubarak ever did," Trew said. Opposition leader Mohammed ElBaradei said that Morsi had become “a new pharaoh” with the powers he had granted himself, significantly violating democratic principles. “The Egyptian political community is getting more complicated and dangerous…we have two separate camps right now…people have a lot of anger towards the Muslim Brotherhood and the ruling party in general,” human rights activist Shimaa Helmy told RT. The political unrest will continue in Egypt until the people are granted real political freedoms, Lawrence Freeman from Executive Intelligence Review magazine told RT. Washington has acknowledged the decree, saying that it has raised concerns for many Egyptians and the international community. "We call for calm and encourage all parties to work together and call for all Egyptians to resolve their differences over these important issues peacefully and through democratic dialogue," State Department spokeswoman Victoria Nuland said in a statement. In a speech in front of his presidential palace in Cairo on Friday, Morsi told Egyptians that his aim was to "achieve political, social, and economic stability.” He said that he would never use legislation for personal reasons, or to settle scores, and that he wants to ensure the independence of the executive, legislative and judicial authorities. “I will never be biased. I will never be against anyone – any Egyptians – because we are all together and we need to give the momentum to the freedom and democracy and the transfer of power. And in order to be able to take care of everything you like, I like to be honest and take care of everything you care about because I like to support what you want to have: Stability and safety," he said. Despite the controversy surrounding Morsi and the Muslim Brotherhood, many said there would be little to no political structure in Egypt if the party didn’t exist. “The Muslim Brotherhood didn’t act as a leader when the Egyptian revolutions started, but it somehow managed to take a leading position and place itself at head. Now, if we exclude the Muslim Brotherhood, then we wil not find any leader at all,” Middle East expert Leonid Syukiyanen told RT. But journalist Ahmed Fathi believes military rule in Egypt has simply been replaced by another kind of dictatorship. Meanwhile, the United Nations said the decree raised serious human rights concerns. “We are very concerned about the possible huge ramifications of this declaration on human rights and the rule of law in Egypt…we also fear this could lead to a very volatile situation over the next few days, starting today in fact," UN Human Rights spokesperson Rupert Colville said in a statement on Friday. Morsi said that the move was vital to protecting the revolution that ousted Mubarak two years ago, and to cement a democratic transition for Egypt.